The intelligence panel discusses the issues during the event on Thursday, April 11th in the CUA Law School. 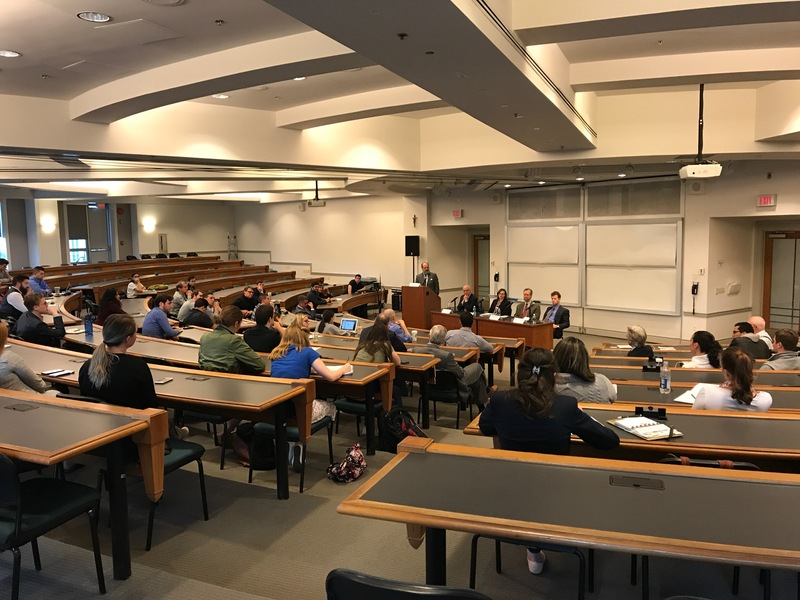 The Catholic University of America’s Institute of Human Ecology hosted a symposium on modern intelligence surveillance this Thursday at the Columbus School of Law’s Auditorium. Entitled “The Ethics of Technical Intelligence Collection”, the symposium was moderated by Nicholas Dujmovic, director of the university’s Intelligence Studies program. Invited guest members of the symposium included Scott Shane, veteran reporter of The New York Times’ Washington, D.C. bureau, Michael O’Hanlon, a senior fellow in foreign policy at the Brookings Institution, Allison Stevens, current deputy general counsel for the National Geospatial-Intelligence Agency, and Michael Hayden, retired U.S. Air Force four-star general and former Director of the National Security Agency and the Central Intelligence Agency under the George W. Bush administration. Hayden is the only official who was both NSA Director, between 1999 to 2005, and CIA Director, 2006 to 2009. Approximately 90 students, faculty, and staff were in attendance at the event. In the beginning of the symposium, Dujmovic raised the question to the panel about the justification of technical data collection, and whether the government should be more interested in the public’s safety or privacy. Hayden answered that the intelligence community is getting a “reasonable return on investment” when it comes to data gathering and that the United States has a “manichean” view of the world, in which individuals must be protected from external or internal threats, even when privacy is being invaded or violated. Hayden also believes for the past 15 years, it has been the golden age of electronic surveillance for the intelligence community, but the intelligence field could change in the next few years due to changing and more widely-used technology. When the subject of recent polling after the Edward Snowden leaks showed that privacy should be respected, Hayden said that before the Snowden leaks, people believed that government could do more to protect civilians and citizens cared less about civil liberties. “Then Snowden flipped that,” Hayden said, citing a PEW Research Center study that found three in four Americans aren’t willing to give up privacy for protection now. Dujmovic also highlighted how Americans are willing to submit their own private information to companies such as Amazon or Facebook, but are becoming resistant to submitting private information to the government. Throughout the entire debate, Hayden stated that these arguments should not be an argument about the forces of light versus the forces of darkness when it comes to the topic, but an argument that free people must have all the time in order to maintain security, privacy, and liberty. Other speakers in the debate such as Shane warned that if massive data collecting continues, he warned that we could have another McCarthyist and Nixonian tactical style to spy on citizens. When the issue of encryption was brought up, Hayden sided with Apple during the FBI’s access request to the San Bernardino shooter’s phone, due to concerns over security of the encryption system as well as the abuse of government. During the question and answers portion of the debate, a question was brought up of potential cyber regime change with advances in cyber warfare and the spread of misinformation, especially in the wake of the recent alleged Russian interference during the 2016 election. Hayden, who called the interference an act of “honorable international espionage”, agreed that cyber regime change is possible, but the gradual steps have mainly been cyber theft and information warfare by hacking into DNC emails and using Russian state media to proliferate propaganda online. Students attending the event gave a positive review of the symposium, believing the event was necessary for important dialogue regarding critical modern issues. The institute’s symposium comes at a controversial time this week when Facebook co-founder and CEO Mark Zuckerberg testified before both houses of Congress on Capitol Hill to massive data collection from Facebook’s own users without permission, as well as the spread of fake news and other forms of misinformation on the popular social media website used by more than one billion people worldwide.